Move over, circle time. At a day care center in Gaithersburg, Maryland, toddlers are tackling science projects — even learning how to make medicine. 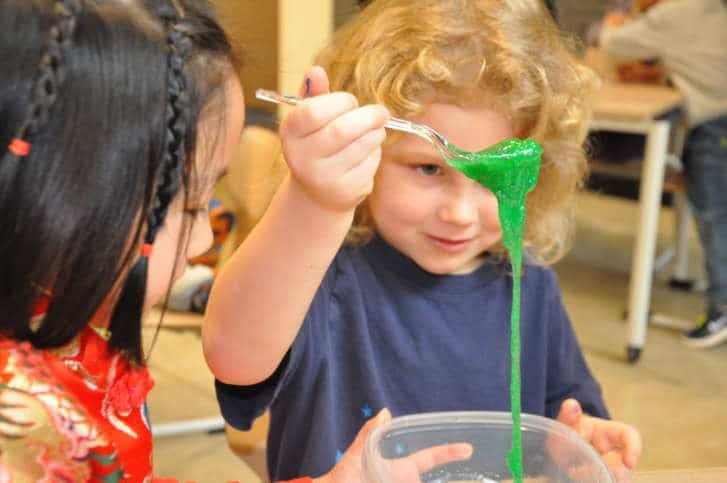 WASHINGTON — At a Bright Horizons day care center in Gaithersburg, Maryland, a class of 4-year-olds are tasked with an important morning activity: making medicine. Granted, the “medicine” they’re mixing has a bright blue hue and is speckled with glitter, but the process they follow is similar to those the scientists across the street keep at the biotech company, MedImmune. “I’m going to go ahead and pass things out. This is our first reagent,” said Ryan Cummings, a MedImmune scientist who specializes in immuno-oncology. Bottles of glue are distributed throughout the classroom, followed by food coloring. As the children work to get the right consistency of their slime, Cummings suggests they add more baby oil or pull back on glitter. He tells the kids the trial-and-error methods they’re testing are what he does every day at work. “We’re constantly having to use our imagination and try new things — think outside the box, try things other people haven’t tried before. In doing so, we’ll find new ways to improve our medicine,” he said. MedImmune is one of the growing number of companies adding day care facilities to its campuses. Chief Operating Officer Matt Bell said the addition of the center, which opened last fall, is a nice benefit for the employees. But the company wanted to go beyond offering a mere amenity. Adding a parent-led early-learning science program was one way to do that. “Everybody on campus is passionate about science, they’re passionate about innovation, and the chance to bring STEM programming into the day care just made sense,” Bell said. A growing body of research supports that early introduction to STEM is not only beneficial to a child’s development, but it’s inherent. Research from Common Sense Education and The Joan Ganz Cooney Center at Sesame Workshop New America found children as young as 1 can conduct systematic experiments. Cummings, who has a doctorate in microbiology and immunology, has been with MedImmune since 2016. He has two children enrolled at the day care facility — a 3-year-old and a 1-year-old. When he learned there was an opportunity to lead experiments in his kids’ classrooms, he jumped. “It’s a win-win,” said Cummings, who had to walk just a short distance from his office to the center for the slime lesson. Beyond that, it’s a way for young ones, ages 6 weeks to 5 years, to better understand what their parents do “all day long in that big building we can see from the playground,” said center director Jennifer Fairfield. “It also shows them that what they are learning and doing here translates to what their parents do at work,” she added. A few months ago, the children grew bacteria in petri dishes; next month, they’ll construct a building out of Legos. “Where is the exposure to science, unless we’re actually bringing it to them? It’s kind of hard to bring science that we do in the lab here, right? So finding creative ways to do that will get their curiosity, will build their sense of wonder and ability to ask questions, and then hopefully replace us as the next budding scientists,” Cummings said. After everyone’s slime came together, the lights went out. It was time to study why some globs glowed in the dark, while others remained dull.